In the NFD Accounts office I talk with Pauline Walker, (who having arrived at the Foundation in 1974 has worked for NFD these past 14 years) and Bob Gordon, NFD’s Operations Manager. Later, Paul Randell NFD’s Managing Director joins us. The staff group consists of a mix of age from 18 to 64 years old and a large variety of personalities, what Paul calls ”quiet and shy to loud and bossy”. Over the past year the team has also increased its ex-Findhorn Foundation employees to four with the arrival of Jacqueline Palmer as Project and Commercial Manager and Shirley Barr as Reception Administrator. Legal status: Business, with directors: Paul Randell (Managing Director), Alex Walker, Camilla Bredal Pedersen and Paul Johnson. Employees or co-workers: Three full-time and 14 part-time staff and three managers. 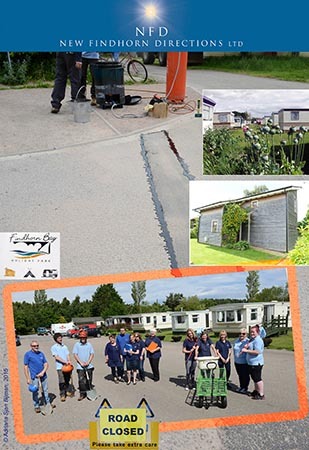 Year founded: In 1983 the Findhorn Foundation established a business wing, the NFD, so it could buy the Findhorn Bay Caravan Park. Vision: NFD strives to embody the Findhorn Foundation’s guiding principles and ethos in its daily work in the commercial world. Mission/Goal: To provide accommodation, infrastructure and other site services in the Park Ecovillage and in partnership with the Findhorn Foundation and community. Previous and current activities: NFD Ltd, as the Findhorn Foundation’s trading arm, manages: residential and holiday let accommodation; commercial property management and infrastructure and utility services management for the community’s 15-hectare eco-village estate. Income: Holiday lets (23 caravans and 2 eco-chalets), residential lets, estate management and utility supply sales.